In early 1970 Joni Mitchell decided to retire from performing, and she took time off to travel and reflect on the celebrity that she'd sought and found, but hadn't enjoyed since the first flickers of fame had approached her with a gasp in their voices. She performed at a few festivals in the summer of 1970, but did not take on a regular concert schedule for most of the year, yet was still voted Top Female Performer for 1970 by MELODY MAKER, the U.K.'s leading pop music magazine. Joni told writer Larry LaBlanc "In January I did my last concert. I played in London and I came home. In February I finished up my record. I gave my last concert with the idea I'd take the year off, because I need new material. I need new things to say in order to perform, so there's something in it for me. You just can't sing the same songs. "I was being isolated, starting to feel like a bird in a gilded cage. I wasn't getting a chance to meet people. A certain amount of success cuts you off in a lot of ways." She traveled throughout Europe, visiting France, Spain, and Greece. 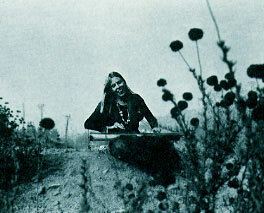 On the ancient isle of Crete she took up the dulcimer and rapidly wrote a series of songs dealing with her adventures, including "Carey" and "California". On her songwriting she said "I do a lot of night-writing. I need solitude to write. I used to be able to write under almost any condition but not anymore because I have to go inside myself so far, to search through a theme. "First of all I'll write something down and then I think: 'Oh, I like how the words sound together but it doesn't say anything.' When I finish a new song I take it and play it for my friends who are fine musicians and writers. I'm very impressed by their reaction to it. If they like it, I'm knocked out. I guess I write for those people. They're really my audience." In these lines from time to time ..."
In April, Joni was heard on background vocals on Carole King's masterpiece "Tapestry", and the next month she had a featured appearance on James Taylor's album, "Mud Slide Slim and the Blue Horizon", including the number 1 single "You've Got a Friend." (written by Carole King). The album, "Blue" was released in June 1971, but it had nearly reached the record buying public in a quite different form. In early March of 1971, the masters for the album were sent by Reprise to their record plants, and at least a few reel to reel copies of the album were recorded with a different song list. But word came down before many reels were produced that Joni had decided to recall the master tape and substitute two new songs - "All I Want" and "The Last Time I Saw Richard" - for two of the older ones. The two songs deleted were "The Urge For Going", which appeared in 1972 as the B-side to "You Turn Me On, I'm a Radio", and "Hunter (The Good Samaritan)", which has yet to appear on any record. The emotionally naked songs on "Blue" were a result of Joni's wanting to shed the image of the hippie goddess she'd picked up in the past, and to be appreciated for her true self. If she was going to get this kind of rapturous attention, she felt that the reasons should be free of artifice. She says today that "At that period of my life, I had no personal defenses, so there's hardly a dishonest note in the vocals." "Blue" was an almost instant critical and commercial success, and peaked in the top 20 in the Billboard Album charts in September. Joni sold her house in Laurel Canyon, and purchased a piece of property by the water in British Columbia where she could have the privacy and quiet that could never be found in Hollywood. She stayed with her friend, David Geffen, when she was in L.A., and they became occasional roomates. She made the decision to return to the stage after the great success of "Blue" and she presented many new songs on that tour that would appear later in 1972 on "For the Roses." That LP was her first to incorporate orchestral arrangements into her evolving folk-pop sound. 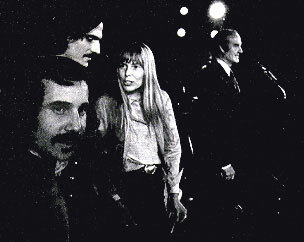 The U.S. tour with Jackson Browne carried on thru the spring, and in the summer before going to Europe for some performances, Joni did a few benefits for Democratic presidential candidate, George McGovern. 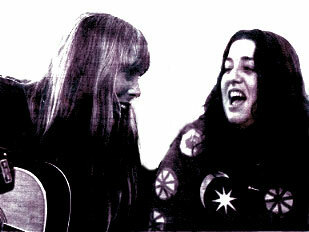 Joni's 5th album, "FOR THE ROSES" was released in October 1972 and immediately zoomed up the charts. She followed with the single, "You Turn Me On, I'm a Radio", which peaked at #25 in the Billboard charts for two weeks beginning 2/3/73, becoming her first bonafide hit single. The album was critically acclaimed with The New York Times saying "Each of Mitchell's songs on "FOR THE ROSES" is a gem glistening with her elegant way with langauge, her pointed splashes of irony and her perfect shaping of images. Never does Mitchell voice a thought or feeling commonly. She's a songwriter and singer of genius who can't help but make us feel we are not alone." 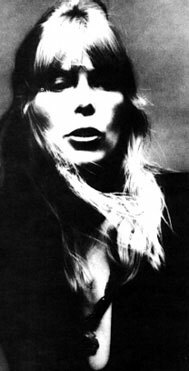 When love makes a fool of me..."
Now that Joni had seen some success on her own terms, would she be willing to give the final push towards a more commercial sound with the possible risk of not staying true to her muse? Or perhaps she could do both? This article has been viewed 20,107 times since being added on March 28, 2009.